Hey mamas! To follow up my last post on what to bring to your birth, I thought I’d go ahead with a general outline for a birth plan! Some like to call them goals, wishes, or preferences, but no matter how you word it, I think a birth plan is really helpful just to give you some space to consider what is or is not important to you. If you are someone who likes to go with the flow, or is fine as long as baby and you are healthy, that’s great, but what if something doesn’t go accordingly to even that plan? Going with the flow is fine, but education is still super important. Birth is full of lots of choices. Some big, some small, and thinking about “the plan” as something of answers to questions you’ve already thought about, but are still malleable is really helpful. While this post may not answer every question, it helps lead you to some great research topics! Some GREAT places to look for evidence based information are Evidence Based Birth, Kelly Mom (breastfeeding), Our Bodies Ourselves, ICAN (VBAC’s and Cesareans), and the American Pregnancy Association. I also recommend reading Ina May’s Guide to Childbirth and Penny Simkins The Birth Partner (for dads and partners). There are lots of other resources, but I definitely recommend avoiding places like BabyCenter and other mommy forums. While they can be great to get support and solidarity, they will not give you evidence based or complete information. Every birth is different, and most moms don’t actual know the whole story when it comes to their birth. They may have missed some details, been unaware of things that took place, or just really don’t really know. In birth, especially depending on what the location of your birthing place is like, things can move very quickly. Having questions like “Do I want the Hepatitis B shot?” “Do I want intermittent monitoring?” “Am I ok with artificial rupturing of membranes?” “Who do I want in the room with me?” and so many other questions, are all so important to research and think about prior to actually trying to handle labor. This way, you already have an answer when they do arise. Let’s be real, you don’t really want to be googling the risks and benefits of intrauterine monitoring while trying to breath through a contraction every few minutes! A really great tool I like to use is B.R.A.I.N. This really helps you know what questions to ask and slow things down for you to be able to make an informed decision. And remember, if a person is trying to talk to you during a contraction, you always have the ability to put your hand up and ask them to pause until your contraction is over so you can think. There are so many different types of birthing situations, so for mamas who aren’t really sure what will happen, for instance in the case of breech baby you’re not sure will turn or not, I suggest having a vaginal birth plan as well as a cesarean birth plan. Even with a cesarean, there are still lots of questions to consider! On a birth plan, I like to divide it up into sections, so it’s easy for providers and nurses to find information quickly depending on what they’re looking at doing. It’s also important to make your birth plan concise, only one page long, front page only. Think bullet points, not full sentences. This is not the time to get an A in English class. ;) If you have an especially interesting allergy, include it in bold red at the top so it’s the first thing care providers see. For example, if you are allergic to shellfish, you cannot have biodyne, a standard cleaning agent for surgery, right before pushing, placing an epidural, catheter, etc. While not common for nurses to forget to check for it, it’s just great to have another reminder in place. Latex, tree nuts, etc. are all important to put on there. 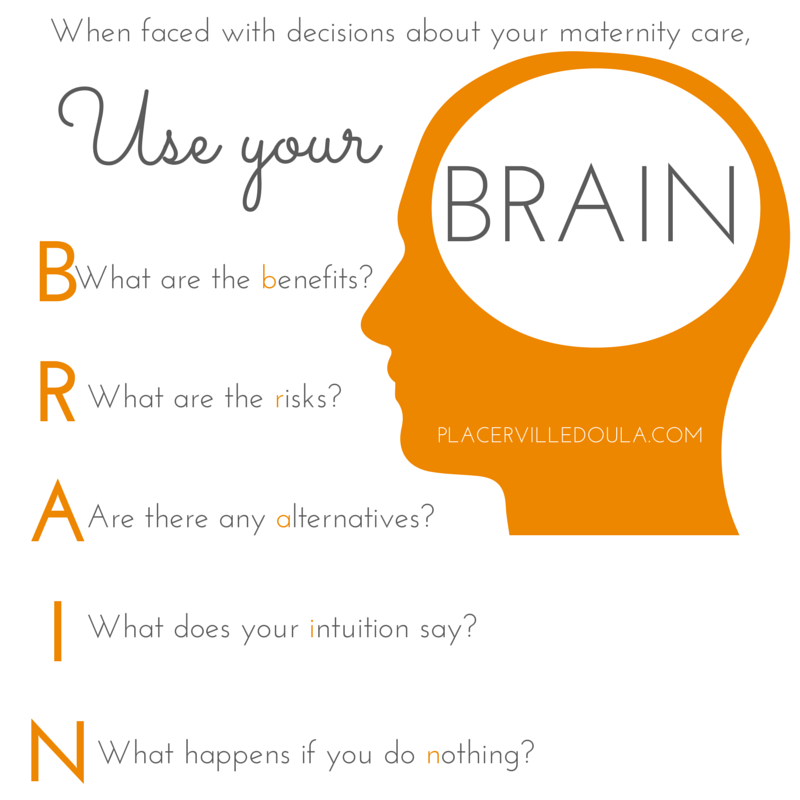 :) There are lots of ways to make your birth plan creative, take a look at this awesome tutorial from a mama on how to construct a visual birth plan! Below is the birth plan I used for my boys’ births. Neither of their births went “accordingly to plan”, but I was still so thankful I had made one! If I go past my due date and the baby and I are fine, I prefer to go into labor spontaneously rather than being induced. I prefer to have no vaginal exams unless medically necessary. Those present will be my husband (husband/partner’s name) and doula (doula’s name). I would like to labor in the tub. During pushing I would like to be in whatever position I choose to be most comfortable at that time. I am prepared to handle pain without medication. I prefer that any narcotics or epidural are not offered. I am open to the option of nitrous oxide if I ask for it. As long as the baby and I are healthy, I would like the baby to be placed immediately after birth on my chest for skin-to-skin contact for at least 1-2 hours before beginning any newborn procedures. Please wait for the cord to stop pulsating (10 minutes) before clamping and allow my husband to cut the cord. I prefer that the placenta detach and be born naturally-no pitocin administered at any time. We prefer to give the baby his first bath, at least 24 hours after birth. We do not want the baby circumcised in the hospital. If the baby has any problems following birth, I would like my husband to be present at all times. We prefer that any newborn procedures occur in our presence after skin-to-skin bonding and nursing has taken place. We would like full rooming in, no separation, no exceptions unless our baby is sick. We prefer any immunizations to be postponed to a later time. We would also like to delay the administering of eye drops until after breastfeeding and bonding has occurred. We also would like to delay the administration of Vitamin K until after breastfeeding and bonding has occurred, unless medically necessary. Often when the subject of birth plans come up, the “all I want is a healthy baby” statement also arises. I never want to diminish this point. Yes, a healthy baby (and mama) is what matters most, but it not the only important thing. If an alive mom and baby are the only things we value and are the only standard we are holding our care system to, then that leaves a lot of things to the wayside. I believe that it is also very important to factor the experience of a mom and baby into the equation of what constitutes as a healthy mom and baby. A traumatized mom, a baby who is having adverse feeding effects, and a family unit who does not feel supported as they are transitioning into a new stage is not a great foundation to be a healthy home. Right next to alive and physically well, is support, empathy, care, and love. Going through questions will help you individualize a plan and care team that will help you be uniquely supported through this amazing, wild time that is your birth! :) What it all boils down to is this: some things that matter to me, my bestie could care less about. And that is really, really. ok. It’s not always about educating - and believe me, as a doula, educator, and birth enthusiastic, I care a LOT about education. It’s really about supporting. Ask questions, and be kind. Below you’ll find a list chock full of questions to think about. Do not, I repeat, do not include all of those on your birth plan. Some may not apply to you, some are just for you to think about but are not necessary for your entire care team to know, and some are important to have on your plan. There’s lots of articles attached for you to do some reading up on things you may be unsure about! If you see something you have questions on, feel free to leave a comment or direct message me through Facebook or the Insta world! And with that, I’ll leave ya’ll to it! This was a hefty one, and it may feel a tad like drinking from a fire hydrant! Don’t stress though mama, no matter what, at the end of the day, you will birth your baby. You are already an incredible mom. And you’ve got this. Birth Plan Q. 's - aka what the heck do I care about?? Vaginal exams before active labor? Membrane sweeping and/or castor oil cocktail? Are you going to attend a childbirth education class? Who do you want in the room? Is there anyone you do NOT want to be allowed in? What is the birth place’s policy for visitors (how many, hours, age, wristband, etc.)? If at a teaching hospital are students ok? Would you like to wear a hospital gown or your own clothing? Continuous monitoring (finding out also if the facility has wireless or not wireless only), internal monitoring, or intermittent monitoring and what that means for the way you can move during labor. How would you feel about an episiotomy? Would you prefer to have your provider stretch your perineum/tear naturally? If you have other children, what is your plan for them during delivery? Do you want them present? Photographer? If not hiring one, do you want someone on your support team to take pictures? Would you like to use hydrotherapy? If baby or you is not ok, who do you want to go with baby, and who do you want to stay with you? Save all newborn care routines until after 1-2 hours of skin to skin/nursing? Delayed Chord Clamping? Here's a second article about DCC. Pitocin shot during pushing/immediately after when placenta is being born? Full room in (baby stays in room) or nursery? Are you ok with the use of a pacifier and/or sugar water? Are you going to save/encapsulate your placenta? Are there any specific tests or conditions you would like checked for due to family history, etc.? If baby is breech, would you like to try an external version and/or Webster technique? Would you like to be fully conscious or under general anesthesia? Partner to remain with you the entire time? The screen lowered or clear drape so you can watch baby come out? Hands left free so you can touch the baby? Extra nurse (specifically a “family nurse” in some hospitals) in room for immediate skin to skin? Procedure explained as it happens? Playlist playing (if a planned cesarean)? Dimmed lighting except for a spotlight on belly?